5 Facts About Black Friday ‘Deals’ Stores Hope You’ll Never See! If you’re planning on setting up a tent outside of your local big-box retail giant to get the best deal, as many Americans traditionally do on the Friday after Thanksgiving, you’re being duped by an elaborate marketing scam. 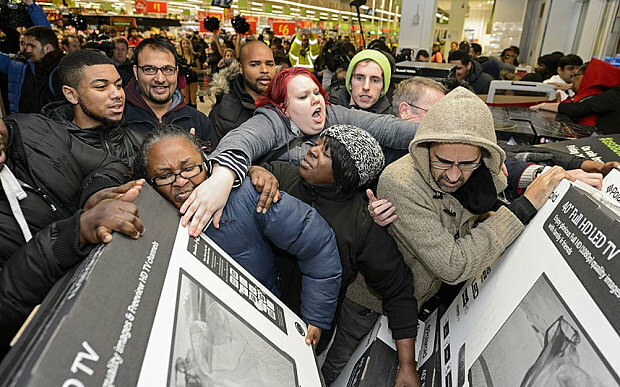 Here are 5 reasons why Black Friday, and the “discounts” offered by the big box stores, are just a ploy to get you in the door and give them your money. 01. You pay more for most things on Black Friday than the rest of the year..
As it turns out, deals as a whole are just as good if not better throughout the year, depending on what you’re buying. Sometimes the biggest discount is a month before Black Friday, sometimes its better just a few days before Christmas, sometimes the discounts are cheaper after the New Year, or in early Spring, or in mid-Summer. The point is, crowding into a big-box store due to the impression that the discounts will never be lower throughout the year is just flat-out wrong. The best deals on flatscreen TVs are often a week before the Super Bowl. Discounts are sometimes 10 percent lower than on Black Friday. Beats by Dre headphones actually sold for 5 cents less in July than on Black Friday. Buying a new car should wait until April — that’s when dealers have an oversized inventory after Spring auto auctions and are more agreeable to haggling. The deepest discounts on new furniture are in January, during New Year clearance sales. New furniture models are offered in August, so the old inventory is being sold at a deep discount in July. For the best deals on jewelry, wait until after Valentine’s Day, when prices are discounted between 15 and 25 percent for most items. March is the best time to buy luggage, as that’s when the travel season slows down. Prices for luggage can be between 20 and 70 percent off, according to Kiplinger. For new mattresses, wait until Memorial Day sales in May for a discount of up to 70 percent. Post-Valentine’s day discounts for perfume are better than on Black Friday, as prices are, on average, between 15 and 25 percent lower. Black Friday deals on tools pale in comparison to Father’s Day. Tools are discounted by 5 to 15 percent. Winter clothes are discounted by up to 75 percent in January as retailers make room for Spring clothing. Snowboards, skis, and hockey gear are discounted by 10 to 20 percent in January. Don’t believe the Black Friday deal on watches: A Citizen men’s watch dropped from $379 to $350 between Black Friday and March. Ugg Boots only $85 in September and October. On Black Friday and Cyber Monday, they cost $135 and $137, respectively. In 2012, a Samsung 46-inch flat screen LCD TV cost $1,159 in October. By Black Friday, it cost $1,355. The cost of a Sesame Street Elmo plush toy went up 31 percent to $17.78 on Black Friday, compared to what it cost in September. 02. The doorbuster deals are sometimes entirely fabricated just to get you in the door.. The shoppers who camp out at stores overnight to catch the Black Friday “doorbuster” deals are getting played more than the usual Black Friday shopper. Items are either rarely stocked, offered online at the same discount, or not stocked at all. In the case of one doorbuster deal at a Walmart store in Jackson, Alabama in 2010, all of the Xbox game systems offered for $199 as a Black Friday doorbuster had already been sold before the 5 AM official Black Friday opening time, according to one angry customer. A study by USA Today’s Matt Granite learned that for every 300 people in line outside a store on Thanksgiving night or early morning on Black Friday, the store only carries six of the advertised products. Granite pointed out that in the case of 40 percent off doorbuster deals on cell phone cases, that same discount had already been offered throughout the year at websites like tanga.com and amazon.com. Beats by Dre headphones were sold at the same Black Friday discount price in July on premierhotdeals.com. In the case of Apple doorbuster deals, Black Friday deals were repeated online, and on macmall.com. 03. ‘Deals’ are concocted to achieve pre-established profit targets..
Black Friday “deals” are just part of the same pricing strategy that retailers draw up ahead of every year — corporations definitely aren’t losing money due to the deals offered on Black Friday. What most shoppers wrongly assume is that the deals are a result of stores stocking too much inventory, and offering deep discounts to move merchandise off the sales floor. But in fact, the prices are set with the discounts built in. the Wall Street Journal reported that while the number of “deals” offered at major retailers went up by 63 percent between 2009 and 2012, and that the average discount went from 25 percent to 36 percent off during that same time period, profit margins remained virtually unchanged. The Wall Street Journal looked at the gross margins of companies offering these discounts and found that during the holiday season, margins hovered around 27.9 percent — margins for the quarter before the holiday season were at 28 percent, and only dipped as low as 27.8 percent in the fourth quarter, despite the “discounts” offered during the holiday season. 04. The best Black Friday discounts aren’t even in the store..
Retail stores have become more savvy with the times, realizing that a greater percentage of holiday shopping is done online and on mobile devices than in-store. So instead of camping out all night outside of a store, or leaving the dinner table to join the rush to the 6 PM doorbuster deals, you’re just as likely to be able to find the same deal without even leaving your home. Lee Senderov, head of marketing for discount-hunting app Shopular, said that deals are now offered through multiple mediums in order to reach the most customers. 05. Black Friday deals are often better just before Christmas..
Stores use the holiday shopping season as a way to get rid of excess inventory. Retailers will often put “Black Friday” stickers on items that have been discounted for weeks just to get them out the door. Despite the lack of a marketing craze, Gap offered a 40 percent off discount for Black Friday that occurred again in December, just days before Christmas. But the best discount Gap offered customers was actually two months later, in January, when discounts were offered at 50 percent below list price. Clothing retailer J. Crew offered similar 40 percent discounts on Black Friday through Cyber Monday and again before Christmas. J. Crew’s 50 percent off sale actually occurred in April. According to Arnold Aronson, former CEO of Batus Retail Group (1980s parent company of Saks Fifth Avenue, Marshall Field’s, and Kohl’s), retailers are more likely to try to get rid of excess inventory in the days before Christmas, rather than to discount them further after December 26. “They have to provide value on the day, but they engineer it in a way that they can control their own destiny rather than fall victim to it,” Aronson told the Wall Street Journal.